Hilary Clinton has had speculation circling around her for quite some time now. Will she run for president in 2016 or not? All predictions say she will but she has not given a straight answer in any of her interviews or conversations with the media. There is a lot of support for her to run, but, if she chose to, she would meet a lot of tough questions to answer for. The biggest of all of the questions would be her involvement in the Benghazi incident. 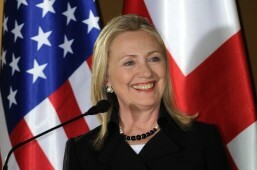 She has shown an ability to get people behind her and respond to the tough questions, but it would be an uphill climb. Adding to both the humor and the speculation of her situation, a reporter recently asked her whether she would be in the presidential race for 2016. Specifically, the reporter asked, “Do you have time for a few quick questions about 2016?” Her response … “Not now, I’m running!” A little double entendre to poke fun a the reporter’s question and the constant questions she receives from every angle. Whether she will actually run or not will remain to be seen (though she probably will), but it is good to see her as more personable than she may have been portrayed in the past.